Vision of Hope hosted its annual Northern Day at the Races on May 19, 2018. This year, not only did SAIC have three student ambassadors escorting guests to their tables and helping with raffle drawings and other tasks, three SAIC teachers also volunteered at registration and checkout. Melissa Nave and Tina Choksi helped greet guests through registration, and Richard Pinto helped check out silent auction purchases. It’s said that “life is about showing up.” Indeed, these and other teachers from the three Bay Area schools showed up and represented our schools well. St. Anthony-Immaculate Conception School, located on the border between San Francisco’s historic Mission District and the Bernal Heights Neighborhood, was founded in 1894 by the Dominican Sisters of Mission San Jose to educate the immigrant children of this neighborhood. 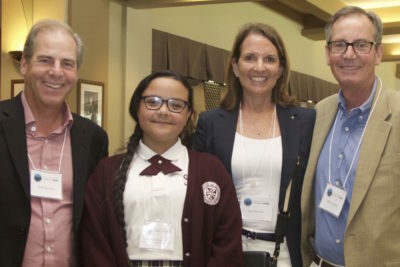 As the demographics of the neighborhood have changed, the mission of the school has remained constant, provide the best quality education possible to the children entrusted to our care. SAIC keeps up-to-date with educational theory and practice to ensure our students are well-prepared for the rigors of high school. 100% of our eighth graders who apply to Catholic and private high schools are accepted to one of their top three choices.